I never expected to be travelling as long as I have and while I am happy to report that I haven’t lost sight of the wider picture, the tightly stacked memories do tend to blur one into the other after a few years time. However, for some reason, within all of those tangled piles of words and memories and photos, food stands out from everything else. Over the years the most equalizing, fascinating and exciting dots for me to connect have involved what we eat, a way of categorizing our universe in a system I understand. I don’t seem to forget a meal, and have no problem recalling each of the tastes that went into it. When someone asks me about a particular destination, I usually launch into a discussion about what they can eat there instead of what sights are worthwhile to visit. Food figures prominently, but tastes are paramount – what went into the dish to make it special? 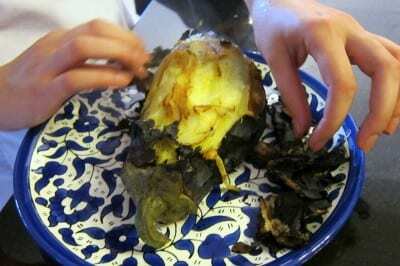 How did one person cook differently than the next? And no conversation about taste and flavour is complete without going right down to table level and examining condiments. Chicken gizzard never tasted so good. A great meal at Kismet Muhallebecisi in Istanbul. This summer, I wrote a post called Ode to Spices, explaining that for me food does not just provide a connection to local people, but also an insight into the naturalness of creation that goes into roadside cooking. One egg becomes a multitude things, merely by virtue of two or three other ingredients. The flip side to this coin is to whittle food down to its essential flavours, and then use those flavours as a conduit for learning about history and the cultural quirks of the places I visit. 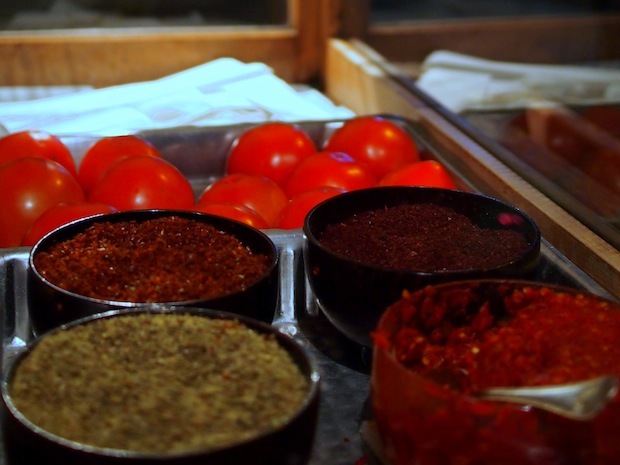 What better place to start than looking at condiments and table spices? 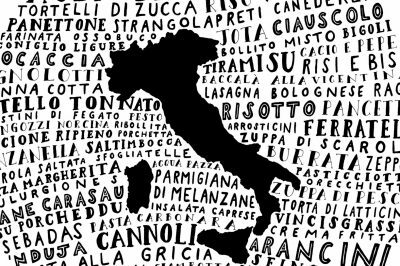 Each country and often towns within them have their own ways of eating, adding extra bits of spice or sourness to an already completed dish. Whereas in North America, condiments are minimal – ketchup, mustard and mayonnaise or steak sauce are as far as most restaurants go – elsewhere they are plentiful, creative and integral to overall enjoyment of the meal. And what we now consider basic table spices were, as many have noted, previously weighed in gold and blood. Table condiments at a street stall in Marrakesh, Morocco. In my recent travels through Morocco, I found myself in a tiny town called Ouarzazate, a gateway to the edges of Morocco’s Sahara. I had just driven across the High Atlas mountains and down to the parched lands below. I wanted to stop for the night in Ouarzazate before making my way to the end of the road, a tiny dusty town called M’Hamid. Because I have celiac disease, Morocco’s foodstuffs are slightly limited; tagines are not an issue but the couscous and breads that accompany them (and are so integral to eating in the country) are off limits. I took to apologetically explaining in French that my stomach couldn’t handle wheat or bread, and could they please make me eggs instead? Luckily, eggs were available in even the most remote of towns, and an omelette was always delivered with a smile. While waiting for my breakfast omelette in Ouarzazate, I looked down at the table and saw three table condiments waiting for me: cumin, salt and pepper. Table spices in Ourzazate, Morocco. Pepper has little redeeming nutritional value, but is one of the more historically significant spices of them all, growing as a perennial climbing vine endemic to the lower slopes of the Western Ghats on India’s Malabar coast. Malabar was central to the global spice trade for centuries, in large part due to the pepper harvest. The European discoverers were looking for Malabar when they set off, seeking a new route to a mystical world, one where pepper and other spices (cloves and mace, as well as nutmeg) grew in abundance. Though pepper is now harvested elsewhere too, no examination of the spice is complete without tracing it back to its source in the tropics of India. 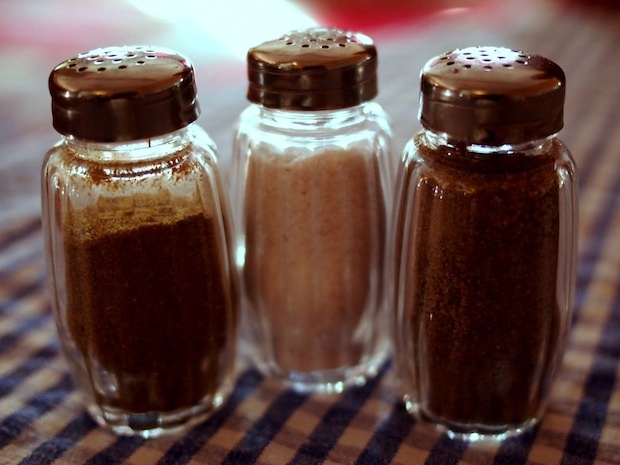 We all know salt, of course – also a source of much volatility and fighting over the years. Mark Kurlansky’s book of the same name, Salt, is an ideal micro-history of the mineral and food preservative. I won’t delve into its background here, but I do highly recommend the read. It’s a fascinating snapshot of how history might have been different had salt not existed. While we tend to think of pickling as relating to pickles themselves, very little is off-limits in pickle-crazy Turkey. Cucumbers, eggplant, cabbage, chilis, carrots, onions – you name it, all pickled in grape vinegar, salt and spices. There are even stores where you can bring your produce and pick it up later, pickled to satisfaction. Pickled chilis as condiments in Istanbul, Turkey. Pickling was historically a way to preserve food for long journeys, to increase the flavour and inject some vitamins into your meal (during the fermentation in pickling, bacteria produce vitamins as they digest vegetable matter and can result in enriched products). 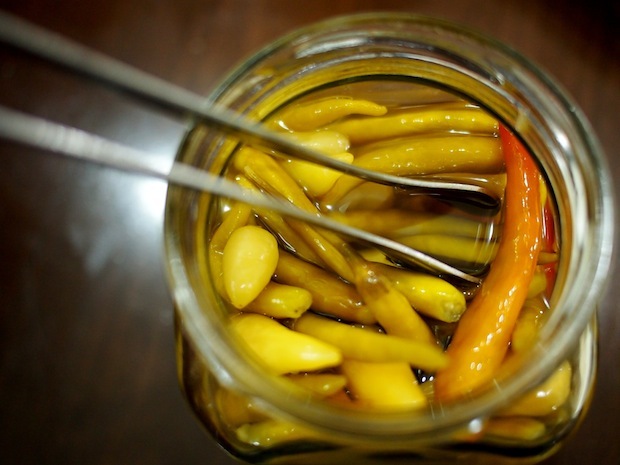 Its useful genesis aside, pickled vegetables remain a much-loved condiment in Turkey. While I will write more about the wonderful foods from the country, this historical holdover shouldn’t be ignored. Plus, a jar of bright pickled vegetables on a street stall table is always a welcoming sight. What cumin is to Morocco, za’atar is to Jordan, available on almost every table and easily accessible if absent. 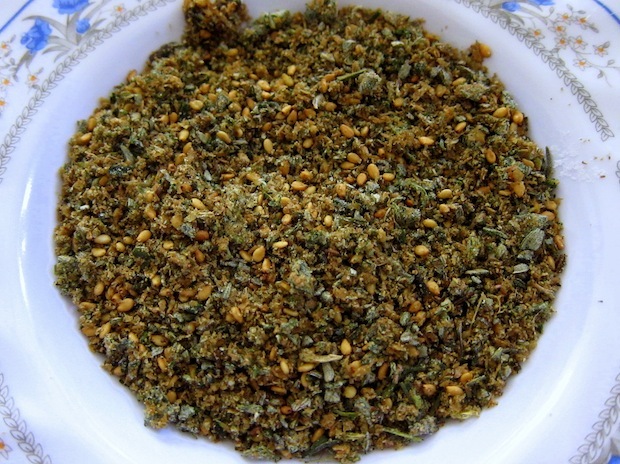 When used in Jordan, za’atar refers to a blend of herbs and spices such as thyme, oregano, savoury and often sumac and sesame. 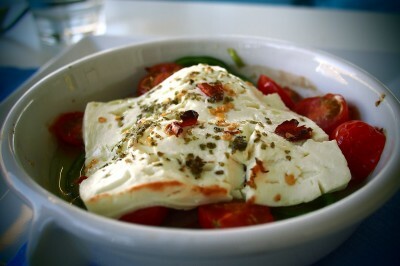 Added in the morning to fresh pita, later on in the day to salads and on meat dishes its prevalence is unmissable. In addition, its history is fascinating because no one seems to be able to agree where it came from. The word za’atar has been used to mean a spice blend from Jordan, Syria or Lebanon, a variety of thyme plant in Egypt (then called saem), and the majorana syriaca plant used so frequently that it has been harvested to the brink of extinction. Digging up a definitive history can lead one as far back as Biblical times, with no clear answers. When in Jordan, several people told me that za’atar had medicinal properties, that it helped memory sharpness and stomach troubles. The same statements were repeated elsewhere in the Middle East many years ago, when I first tried za’atar around my 13th birthday. Regardless of provenance (and perhaps a small bit because of it) it’s a delicious addition to any meal. Thais tend to customize their food once it arrives on the table. While we would think it offensive to receive a dish and then start liberally adding new tastes, such is the norm in most of Thailand. Much like eating utensils in the country (chopsticks for soups, spoon and fork for rice dishes and hands for Northern Thai food), what you add depends on the food used. As my friends in the country have noted, every Thai has a personal ritual when they receive a dish, their very own meditation on how to increase the heat or sweetness of their meal. Streetside stalls and fancy restaurants alike will have a puang kreuang prung on the table (literally, a circle of seasonings) a plastic or metal holder with a quad of additional condiments: naam plaa (fish sauce), prik pom (chili powder), prik naam plaa (chopped chilis in fish sauce, sometimes in vinegar instead), and sugar. Each of my Thai friends had a different way of eating their foods, but all modified based on a mixture of the hot, sour, salty and sweet rules, with emphasis on one flavour coupling. Much has been said about Thai food and the complexity of its composition, but it always made me smile to see a flavour-filled dish come out of the wok, only to be re-layered in taste before it is consumed. Especially when the “circle of seasonings” came in a baby bottle, as with my favourite pad thai stall on the streets of Chiang Mai. 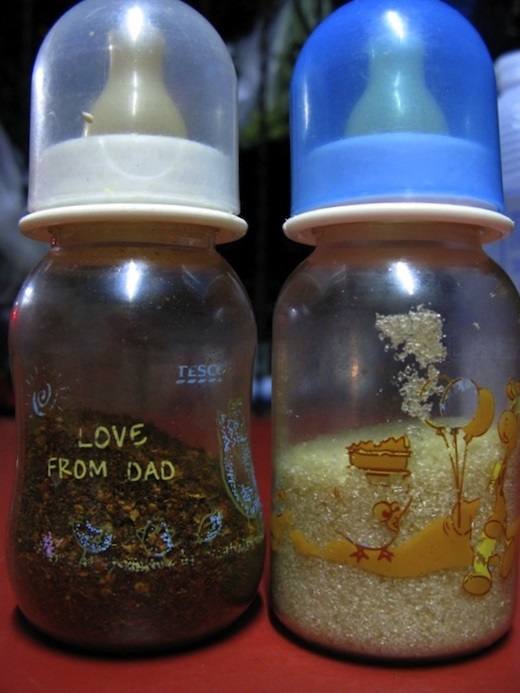 Chili flakes and sugar on a Chiang Mai table (in a baby bottle). 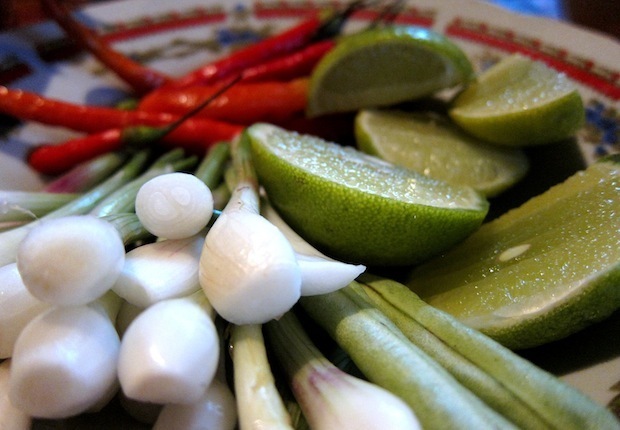 Contrary to its sweet-tooth neighbour, Thailand, savoury foods in Laos are not served with a jar of sugar on the table. Instead, dishes are sometimes quite bitter, often spicy and more salty than I was used to. Another difference is the table accompaniment: instead of the circle of spices, a large plate of fresh herbs and lime, chili and green onions is plonked down in front of you, shared by all. Fresh mint and dill, rarely used in Thai foods, were often on the platter and liberally added to soups and meat dishes. While many compare the foods from Laos to those of Northern Thailand, there are subtle differences between Laos and its neighbours. To me, the plate of table condiments is both a perfect companion to the savoury foods in the country and a great stepping stone to examining the eating habits as a whole. It might seems strange in a world full of flavour and texture to devote a full post to condiments and table spices. The examples above are by no means exhaustive, but rather a snapshot of some fun and interesting options as I’ve eaten my way around the world. The way that I see food and travel, inexorably intertwined, isn’t just about tastebuds. On one level, the tastes themselves: each of the foodstuffs that make up the dish. But superimposed on all these different colours and tastes, the histories of each. 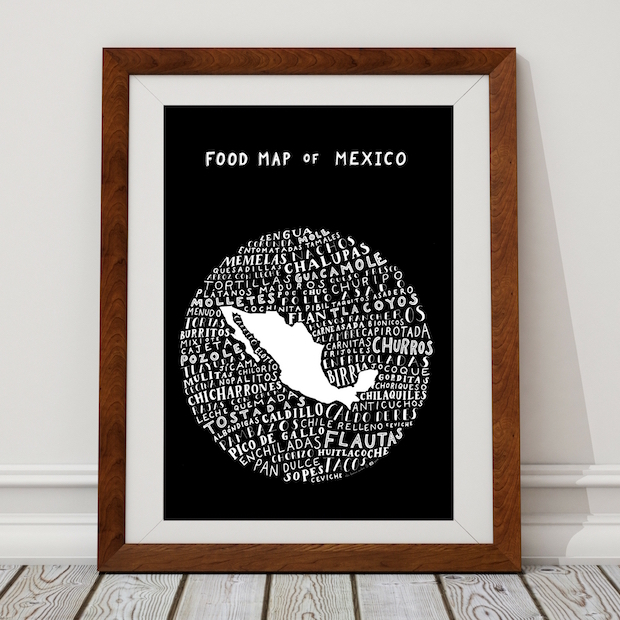 How did a particular food get to be prevalent in this place? How was it originally seen as something of value, and where? So, condiments and table spices. Simple, sometimes funny (when served in baby bottles) and often overlooked. But you’d be doing yourself and your destination a disservice in ignoring what is placed on your table as you travel. Right in front of you, a long history of why people eat the way they do and the food culture that has grown around it. Only you Jodi can make condiments look and sound important! Hi, what a lovely idea for a post. When I arrived at my new office in Berlin one of the first things I noticed was that there were condiments for the staff, balsamic vinegar, olive oil, salt, pepper and curry powder. I didn’t ever use the curry powder, but then again I could buy ‘currywurst’ just round the corner, sausages cut up with ketchup and curry powder sprinkled on top. It’s not fine dining, but tasty nonetheless. It’s true that condiments can take the most boring of dishes and spruce them up in to something fun! Glad you enjoyed the read and happy holidays! This is a wonderful piece. I think it’s often the invisible threads between things that tell the greatest stories about society and culture. I love how you’ve brought them so elegantly to the forefront. This is such a great post!! I love learning more about food and spices all over the world-and can’t wait to try these in Laos, Jordan, and Thailand next year!! I recently picked up Salt after reading Kurlansky’s Cod a few years ago, I’m really looking forward to reading it. I wonder if you’ve ever read “Over the Edge of the World” by Laurence Bergreen? It’s about Magellan’s quest for the Spice Route-your post reminded me of it. It’s pretty crazy to think about how interconnected the world really has been for so long! Thanks Ebbs. You were privy to (and a part of) many of those dinner table discussions yourself, so I can blame you as well for all those connected dots ;) Miss you! this was so great! vivid and interesting and informative. food really is one of the most delightful parts of travel. One of my favorite posts thus far. As someone originally from the US (spending time in MTL with family over the holidays), spices are something I’ve come to love as my tastes developed over the years. Friends visiting for a meal often comment on the selection of spices we have, and invariably we need to explain how or why we use them. There are so many and the variety is a big part of what can make an otherwise simple meal just delightful. Surprised and delighted to see za’atar included – it’s one of my favourite breakfasts. Take a slice of Syrian bread, dip it in fresh olive oil, and then into za’atar. Both my parents were brought up in the Middle East so it’s been a staple at home since my childhood. In fact I think I’ll get up and go eat some now! As you mentioned earlier, you can find it anywhere now – I live in rural France and there’s a Syrian grocer an hour’s drive away. He has an entire counter stocked with… za’atar! Glad to hear you’re a fan of the za’atar too! It’s so versatile and yet it gives such a strong, crisp flavour to your meal that I’m hard pressed to think of what my tastebuds would be like without it. Enjoy your cooking in France – where are you located there? Great post Jodi, this was really interesting to read, and beautifully written. I love exploring the connections between food and cultural history. When I first arrived in Korea (where I currently lived) I was suprised to find that kimchi (spicy fermented cabbage) acted as both a condiment and side dish to every single meal – breakfast, lunch, and dinner. Once I had gotten over the tart taste of it, I started to wonder what exactly makes kimchi so special to Koreans. As it turns out, kimchi has been popular in Korea for thousands of years. Korea is roughly the same size as my home country, England, and in the winter vegetables are equally hard to come by. England combated this problem by invading other countries and either taking or importing food from them to keep everyone fed over the long winters. Korea, on the other hand, thought of a more practical solution – they came up with kimchi. The fermenting process of kimchi means that vegetables can be harvested during the summer, and then kept right through the winter, providing well-needed nutrition during the winter months. It is used in a wide variety of dishes, and a side of it is always served with your meal. For example even if you ordered a kimchi stew, it would still come with a side dish of kimchi. It really is an ingenious invention, and says a lot about Korea, a country which has continually throughout history found solutions to their problems without ever having to invade other countries. Thank you for the long comment Natalie. Fermentation has long been a way to maintain foods without losing them to bacteria or spoilage, and kimchi is a perfect example (and a tasty one at that!). Hope you have many delicious meals during your time in Korea! Thanks for helping me associate names with all those flavors. I’ve tried most of them, but I’ll be damned if I can ever remember what they’re called. 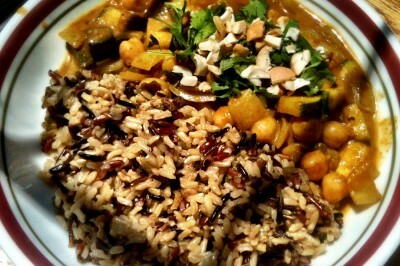 My fave I do know that you didn’t mention is harissa on cous cous. Hi Tom, I’ve been thinking of doing a part two of this series as the piece was already quite long (2000 words!) and there were many condiments, harissa included, that I didn’t fit in. Glad you liked the post! Thanks for sharing this. I love learning about the foods in other countries. Food can tell a lot about the country’s culture. I have to say that the food in Laos sounds very good. Fresh herbs, lime, chilies, and onions sound delicious added to any dish! As a fellow food-lover, I very much enjoyed this post. Nice job Jodi. I have a bottle of the za’atar spice blend in my cabinet right now. Found it in a Chicago Persian shop after returning from the middle east a couple years ago. Sumac is a big ingredient in it, which is also often found on tables in Turkey. 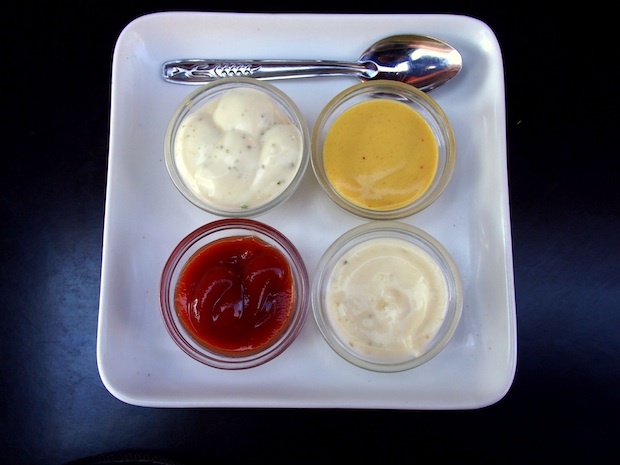 Something fun and yummy: za’atar aioli. Za’atar aioli sounds delicious! I tend to use it in soups too, with chicken and rice noodles and some fresh herbs. Can’t go wrong with za’atar! This is one of the reason that makes me eat more. 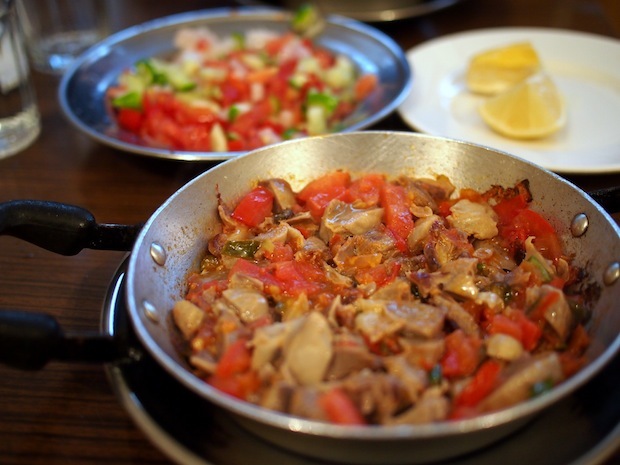 You should check macedonian food. According to me it is one of the best in Europe. I have lived there for 2 years i gain lots of weight i have to admit :). I’ve never tried Macedonian food but will have to check it out. Thanks for reading! I also love to travel and have celiac disease. I have to admit celiac has slowed down my collection of stamps in my passport. I am always afraid I will starve or get sick while travelling. It is nice to see a fellow traveller who can make it work! Thank you for the comment Jen! I’ve unfortunately found I do tend to get sick – it’s almost impossible to avoid gluten, but I find in parts of Asia (within rice basins) it’s a lot easier than elsewhere, and in South America where yuca replaces flour and corn wheat it’s also doable. I’ve struggled this year in the Middle East and North Africa, however – lots and lots of pitas! I just wish couscous wasn’t off limits; it’s so good. I’ll be profiling another celiac traveler shortly, Katie (also a former lawyer) but you can check her out in the interim at http://www.katiegoingglobal.com.